This is a sponsored post written by me on behalf of Columbia Crest Winery for IZEA. All opinions are 100% mine. I don’t consider myself to be a wine connoisseur, but I love a good wine now and then. The thing is when you buy wine enough you learn how to pick up a few tricks here and there that make buying wine easier. Besides, there has got to be a better way of choosing a better wine rather than just picking the prettiest bottle…although I have used this method before. Some are so pretty you just can’t resist! Here are a few of my personal tips I use to choose a good wine. Before you can do better at picking a good wine in the store, you have to know what you like. For example red or white? Sweet or dry? Or are you somewhere in between…a rose perhaps? Go to wine tastings or try a few at home. I once to a party/ wine tasting where everyone brought their own bottle of Moscato and we tasted them all and voted for the best one. It was a blast, but also very revealing how different one When you try enough, you get a feel for how different wine can be and which flavors appeal to you. They can be crisp, sweet, tangy, spicy, dry and so many other synonyms you probably would not expect to be a drink. But trying out a few helps you determine which ones are best for you. Once you figure out what flavors you like in wine, it is time to do some digging! Do you like sweeter wines? Some good ones to try are Moscato, Rose’ and sweet red. Like your wine with a bolder taste? Try a Cabernet, a Syrah or a Merlot. Once you know what flavors you like, it is a little easier to find the wines you want by their name. Next, you have to determine which brands of wine you will try. Something I have learned as a vegetarian is that reading the labels for the food you eat is pretty significant. The same goes for your wine. Even if you pick a pinot grigio, does not mean it will taste like the same pinot grigio you had before if it is an entirely different brand. I always make a point to read the wine description on the back of the bottle since they always describe the flavors of the wine. If you see phrases like “This bold and earthy wine is fantastic!” you are probably dealing with a Chianti or some other strongly flavored wine. If you see words like “This light and fruity wine will leave you feeling bubbly,” then you more than likely have a Riesling or Moscato on your hands. The key is to know the descriptive vocab, so you know what flavors to expect. If you are still unsure of what wine you should be purchasing, have other people, who know better choose for you. This is exactly the concept that sparked a special project for Columbia Crest Winery’s Crowdsourced Cabernet. Columbia Crest is the 1st Washington Winery to receive the honor of Wine Spectator’s #1 Wine in the World which occurred in 2009 for their 2005 Reserve Cabernet Sauvignon. They also have a rich heritage of Washington winemaking through an unwavering commitment to producing outstanding wine. The conditions of Washington State and the Columbia Valley offer perfect grape-growing conditions, from the weather to the soil to the vineyard sites. 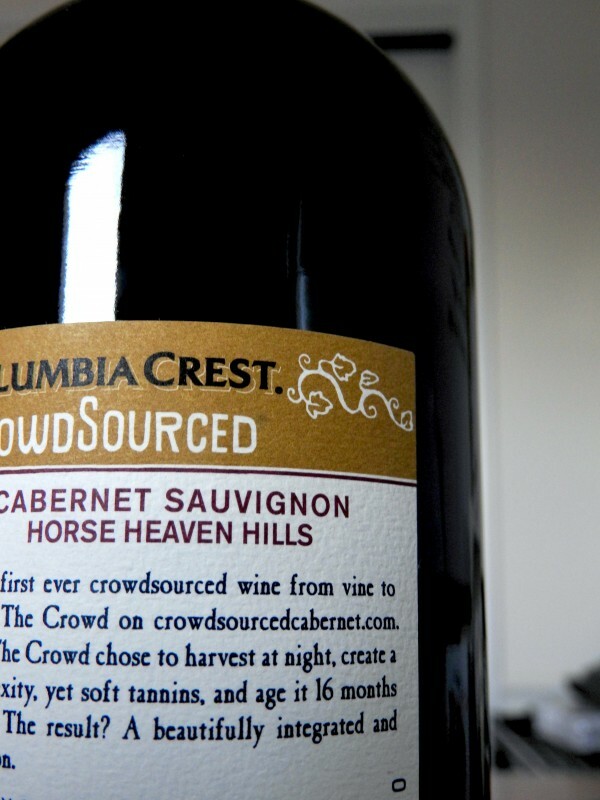 They kicked off Crowdsource Cabernet project in 2014 by inviting the public to vote online on the various aspects of the winemaking process. Their final product resulted in the 2014 Crowdsourced Cabernet™ vintage, and it just went on sale June 3rd! In lieu of this phenomenal internet wine, as I like to refer to it, we decided to throw a little bash in their honor, because it is not every day you find a wine that has a big thumbs up from thousands of voters. The process took 18 months and brought together people from all over to gain a deeper understanding and connection to the art of winemaking. I personally had no idea that the barrel the wine is stored in made a difference, but it is really a great way to learn more about wine and choosing a good one. This is truly the people’s wine – the first ever crowdsourced wine from vine to bottle. History in the making people! They created 1,000 cases, and it is available for $30/bottle, exclusively online or in the Columbia Crest tasting room in Paterson, Washington. Trying this wine myself, I can say it has a bold flavor with a few peppery notes. It’s delicious, and I can honestly say I trust the internet to choose my wine every year! Want to participate in the virtual winemaking experience for 2015? Be sure to visit http://www.crowdsourcedcabernet.com/. Once you choose the wine that works best for you, it is time to celebrate. I have made MANY bad wine choices in my years of wine drinking, and when I find a good one I want to keep buying it is worth a celebration. My boyfriend Chris and I enjoyed the wine so much we had a little get together to try the 2014 Crowdsourced Cabernet™ vintage wine with our friends. It was a hit needless to say! This is, even more reason for you to try the wine that the internet says it’s best :D.
My big takeaway from this post, you don’t have to be an expert to enjoy a good wine. Despite all the knowledge that is out there for wines and knowing what to do to be a pro, my advice, just drink what you enjoy! No need to know the lingo or best practices for enjoying it. If you learn how to pick the wines that you know you’ll enjoy, you will enjoy it even more!